Foodies big and small may find their sweet tooth calling after coloring in this whimsical culinary clash. When a battle rages on between the Food Pyramid and Cake Castle, what's a bowl of Ramen to do: grab a bottle of sriracha and join the fun or watch the food fight from the comfort of the Whipped Cream Hills? Kids of all ages will love painting with all the colors of their food on this jumbo poster, featuring nearly every culinary delight with a cheeky personality and the occasional spaghetti lasso or ice cream catapult. 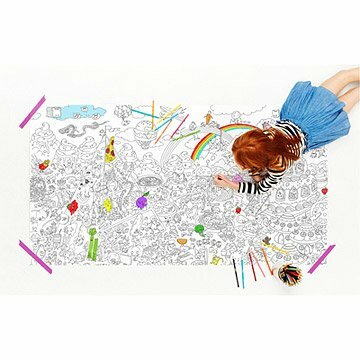 The imaginative vegetable ink-based outline is printed on recycled paper. Made in New York. Add some color with these Eco-Crayon Sticks. Our entire family enjoys helping our 9 year old color this creative poster. Her friends also enjoy helping her color it. It has inspired many educational conversations about food and nutrition. It takes countless hours to complete. The paper and ink are very high quality, the best I have seen.